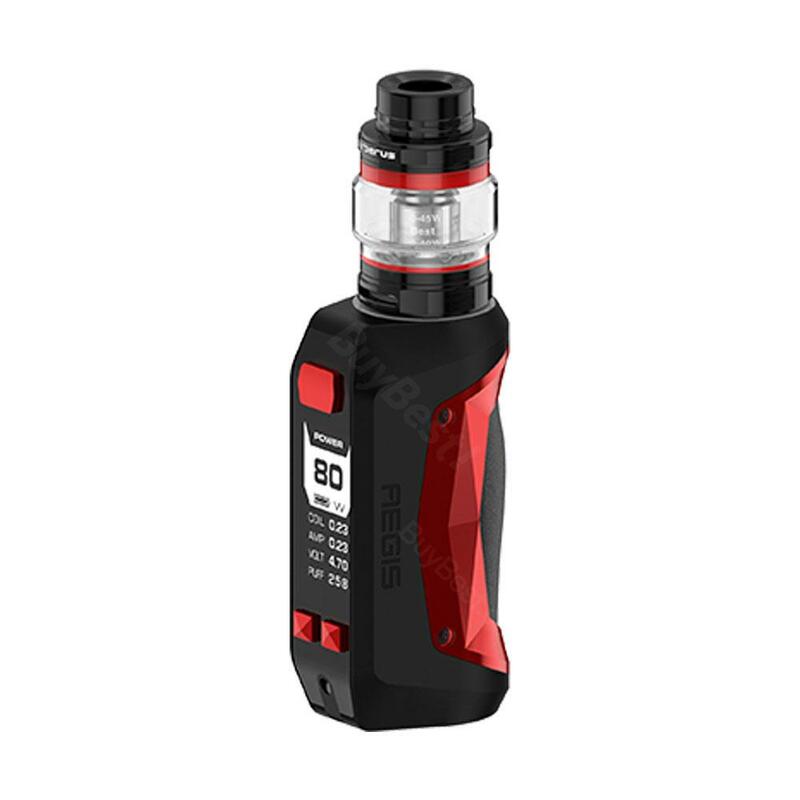 The Geekvape Aegis Mini Kit mainly consists of the Aegis Mini TC MOD and the Cerberus Tank with the super mesh X2 coil. The Geekvape Aegis Mini comes with the advanced AS chipset and IP67 waterproof/ dustproof/ shockproof design. • Geekvape Cerberus Tank, GeekVape Aegis Legend are also available in BuyBest. • It has no e-juice, you need order e-juice separately. I received the aegis mini kit just a week ago and it is the best kit I have ever had. It got here in less than two weeks in perfect condition. As you can see in the picture, you will get the mod, the tank and some accessories. The replacement glass is perfect because it is the only part of this mod that can break because the rest is built to last forever. The charging port is protected by a waterproof door and just in case it breaks off there is an other one in the box. It is IP67 so trust nothing can get in this mod. The charging cable provided is a flat cable which is a nice touche, no tangle. You get 2 mesh coils, both of them are 0.3 Ohms, with a lot of replacements for the joints, and let me tel you those coils are the best. The flavor is great, I'm a more than a thousand puffs in and there are still perfect to me. They are rated 30 to 45 watts so the 80 watts of the aegis can handle it no problem. And it does, I recommend 40 watts for best flavor, just press the button and the power is there instantly no lag at all. The outside of the mod is made of silicon and aluminum so you know it is durable and it feels really nice in the hand as well. The drip tip is small so you get instant flavor from the cerberus tank. You can refill the tank on the top by just twisting the tip it really easy. And the adjustable air flow is perfect and has a really wide range of opening. I had no spills whatsoever and the 5.5ml tank glass last all day for me. You can put in other tank up to 26/27 mm which is incredible for such a small body, the mod part is only 8cm high. The vapor production on the widest opening is mind blowing. Finally a good mod with an internal battery, no need to carry and by some unknown battery and buy an extra charger. Just plug the usb charger and it is good to go. You can even use it and charge it at the same time. With its 2200 mAh battery your will last all day not problem and with a fast charger you can get it to 100 percent in about one hour and a half but the best is that it goes to 80 percent in like 30 minutes on a 2A charger. Once it is done charging it automatically stops charging not like some other bad mods. The screen is really simple and clear with only useful information. You can choose between multiple function. I mainly use power mode but once you are more advanced you can start switching to more advance modes if you change the coil to an other material for example. The VPC let's you automatically change the power with time during a vape according to a preset. The bypass is here to mimic mechanical mod but I don't recommend it to beginners. There are two button for navigation and you can even lock the menu just by pressing them together which is perfect. It feels really nice in the hand because it is tiny but still as a good weight and the finishing is perfect. I got the all black one and the stitches in red really make it stand out and looks cool. This kit in my country is 3 times more expensive than on here so this is really cheap and the service is the best. It is my first mod from geekvape but I think it won't be the last if the quality is the same for other mod. If you are searching for a small fully capable mod or an indestructible mod the aegis midi kit is for you. I might even be buying an other one in different a color for my collection. Geekvape Aegis mini with Cerberus tank. The package arrived in just 6 days! This one is incredibly fast. The package was very well packed, the box was intact. The box contains the mod itself, a tank, additional straight glass, orings, 2 evaporators, a charging cable and an additional plug for the connector. The mod was fully charged. Both evaporators with mesh and they are very tasty. If we talk about box mod, then it is incredibly light and comfortable in the hand. This set is so light that its weight is not felt in the jacket pocket. Inside the mod is an ASChip, the same as in GeekVape Nova or Aegis Legend and this is a wonderful chip. You can use evaporators with a resistance of 0.05 ohms and it has an instant response of 10 ms. This is one of the best chips currently hidden in such a little mod. I also like its chic design and water protection. I have been using this mod for more than 2 weeks and it has not peeled off or deteriorated. The battery is built-in and its capacity is only 2200mAh, but the full charge is enough for at least one full day! I am very used to it and use it every day. By the way, the battery fully charges only 2 hours. It is very convenient. With a cigarette tank, for example, a Geekvape Ammit MTL mod will work for more than 2 days on one charge. Cerberus tank is a very simple, convenient and beautiful atomizer with evaporators on the grid. I have already evaporated almost 100ml of liquid and I have never spilled it. Very tasty tank, I recommend it to everyone! I also want to note that vaporizers from other manufacturers, for example Eleaf, SMOK and others, are also suitable for this tank. This is very convenient if there are no Geekvape vaporizers in the store of your city. But I would still recommend to buy vaporizers on this site, since it is cheap and delivery is very fast! Delivery worked very well. Parcel was packed safely. Very good prices ! Perfect place to order your vape equipment. Excellent mod. Charging immediately, about an hour from zero to full charge. Works very good and feels very good in my hand. Thank you BuyBest! Great product! Awesome I love it! Thank you BuyBest! There is no question that the Aegis Mini is an exceptional mod. It is beautiful, feels great in the hand, and it vapes wonderfully. I'm impressed with the quality and bang for your buck with buybest and this product! 80W Geekvape Aegis mini TC kit 2200mAh with Cerberus Tank The Geekvape Aegis Mini TC Kit mainly consists of the Geekvape Aegis Mini MOD and the Cerberus Subohm Tank. Powered by built-in 2200mAh battery and the advanced AS chipset.